The fanboys were up in arms after the events of the truly great Identity Crisis and the noticably less-great Infinite Crisis. They felt that the creators at DC had it in for Keith Giffen and the characters who filled his version of the Justice League. Never mind that those characters had pretty much been a joke for more than a decade (and not in the good way). No, nevermind that - it was a personal attack, pure and simple. Because it makes more sense that DC Editorial would be carrying out a vendetta like that than it does that these were just unused characters who were disposable, but could still make people care. Not big on logic, are the fanboys. Anyway, all that noise was proven false when DC put one of those joke characters, Booster Gold, in the starring role of their year-long 52 event. Armed with 25th-century technology, this adventurer from the future will do anything to become Metropolis's new hero...and make a little money while he's at it. When he is called upon to make the ultimate sacrifice, he shows his true colors. A former college football star banned for betting on his own games, Michael Carter got a job as a museum guard. Inspired by stories from 500 years before, he stole equipment and hopped in a time machine to become a modern-day hero. He gained immediate fame after rescuing the president of the United States from an assassination attempt, but flubbed his introduction the way Neil Armstrong flubbed his speech from the moon: when the prez asked who he was, he started to give his football nickname - Booster - then caught himself and tried to switch to his intended name - Goldstar. An auspicious start to the career of Booster Gold. Booster was created by writer/artist Dan Jurgens, but really gained popularity in Keith Giffen and JM DeMatteis' Justice League International, where he was paired with Blue Beetle and turned into a bumbling goof. Beetle was released in June 2002, so it's taken nearly five full years for us to get his best buddy. Was the wait worth it? 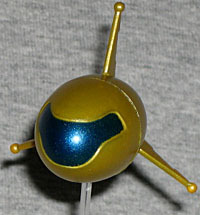 Booster was sculpted by Paul Harding, who did a nice job. 52 had, to put it succinctly, a rotating team of artists. Obviously, producing a full-length book at four times the usual pace is too much for any one artist to handle, so DC kept swapping people in and out. Now, some might ask why they didn't just assign a specific artist to each segment of the story - Artist A draws all the stuff with Steel and his neice, Artist B handles the outer space story, Artist C covers Black Adam and so forth. Sure, that sounds fine, but what if an artist you hate is assigned to a character you love? You'd have to suffer with it for a whole year. Better to swap. Anyway, point is, this isn't really supposed to be an artist-specific figure. In keeping with his old, happy-go-lucky days, he's got a big dumb smile on his face. He moves at the knees, hips, wrists, elbows, balljointed shoulders and balljointed neck. The figure is muscular, but not too much. Booster was never a big bulky guy, but he wasn't thin like the Flash, either. He was a quarterback in real life, so that's the kind of physique he should have - maybe like Payton Manning's body, maybe. And just like Manning (or any popular athlete, really), Booster will endorse almost anything, as long as the check clears. In fact, one of the running gags of 52 was that Booster's costume was covered by sponsors' patches, much like a Nascar driver. It's almost a shame, then, that this version is in his classic blue and yellow outfit - a version plastered in logos would have been a great variant. 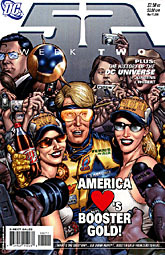 Still, the fans would have been up in arms if they didn't get their "classic" Booster Gold. It still would have been better than his "armored" phase. One cool detail? He's even got the Legion flight ring he purloined from the future. 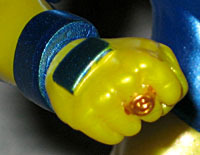 The patches on the backs of his hands are raised elements, though everything other than his disco collar is just painted on. Along with all the equipment he brought back from his home time, Booster Gold also swiped a BX9 security robot from the museum where he worked. The robot, nicknamed Skeets, was programed with 500 years' worth of headlines, allowing Booster to cash in on history to make a name for himself. Of course, that does open some pretty big plotholes. Skeets has changed appearance over the years and, in fact, changed a lot during 52, as well. It was almost like he was evolving. This is Skeets from nearthe beginning of the year, when he still looked like a golden football with three fins on the back. To make Skeets fly, he has a clear plastic stand that lifts him 5½" high. Despite being portrayed as something of a money-mad opportunist and shameless self-promoter, Booster realy got to shine during 52 - in fact, he got particularly shiny when he absorbed all the energy from a leaking nuclear sub, flew up into the skies above Metropolis and promptly... exploded. Still, he went out as a hero, not as a joke, and that's more than could be said of him for years.